Synopsis: The idea of natural, self-regulating order is one of the key elements underlying contemporary discourse about economic and social organisation. However, what exactly is meant by this is not altogether clear. Most of the time, when people refer to natural order they imply that if people were left to do that which they naturally are inclined to do, their activities will spontaneously be synchronised in the sense that they will all get that which they have reason to expect out of the system. We call such an order synchronic order as it synchronises the activities of individuals. However, there are two other elements which must be explored for such an order to have any meaning. Firstly, there is the question of whether natural synchronisation works with all sorts of human behaviour or that it only works with a particular type of behaviour. If so, is there a natural process which will equip individuals with the kind of behaviour necessary for such synchronisation to work? Secondly, once activities were synchronised, would individuals be content with the process and the outcomes (that which they have reason to expect) to an extent that they would feel the need neither to change their own behaviour nor to change the system? We call both these elements, which are required to support the synchronising ability of a natural order, ‘diachronic order’. We use this term to tell us whether that which co-ordinates individual behaviour is something which is sustainable over time (broadly conceived). Clearly, if there is a natural process which equips individuals with behaviour that will lead, without any intervention, to a co-ordination of their activities and where agents do not find the system as morally unacceptable, we can clearly declare that there is a natural, self-regulated order. In this chapter, we take a somewhat cursory meta-historic perspective on the evolution of the idea of natural order. We begin our journey in ancient times and find surprising similarities between some Chinese and Christian thinking about the idea of natural order. We argue that in both cases natural order is in the end an ideal and that individuals are required to behave in a manner which may not be natural to them so that natural order can lead to a co-ordinated outcome. As that which dictates how individuals should behave is derived from the ideal (and hence, constitutes a moral decree), such a system can be sustainable only if morality prevails and is unchanging. In such a case, there will be both synchronic and diachronic orders, but we must note that human nature is not part of the natural order itself. The Enlightenment in Europe changed all that as it brought to the fore the search for endogenous explanations such that were produced for the world of physics. In the social sciences, this amounts to an effort to emulate the notion of equilibrium in Newtonian Mechanics in the analysis of social interactions. However, now both human actions and the formation of morality become endogenous, which means that for a natural order to become both synchronic and diachronic, we must find a process that not only co-ordinates actions but also produces moral norms that support it. The difficulties are exposed at the outset when we begin by identifying Mandeville’s famous paradox which juxtaposed the necessary conditions for an order to produce plenty with moral principles which are perceived to be natural too. We claim that classical economics responded to this dilemma by creating a system which closely connects the emergence of ethical ideas with the working of the system of natural liberty. This endogenisation of ethics—which I believe to be a logical imperative embedded in the idea of social natural order—allowed thinkers like Adam Smith to conclude that for all the wrong reasons, the system of natural liberty could work and temporarily appear as morally acceptable. However, in the long run, namely diachronically, such an arrangement is not sustainable as it will offend the foundation of our moral reasoning: our conscience. Modern economics chose a different route altogether. It simply chose to divorce itself from ethics. 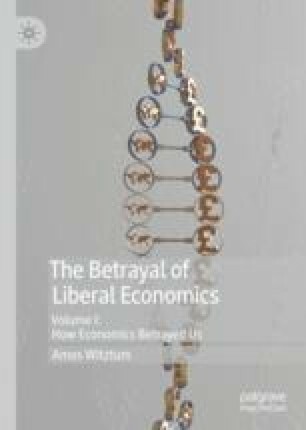 By claiming the economics is ethically neutral, it suggests that the idea of natural liberty in the sphere of economic activities is compatible with all possible social values or ethical principles. This very appealing idea led to the dominance of the modern economic paradigm which culminated in the spread of globalisation. However, even modern economics recognises that the conditions for the natural order to deliver a synchronised outcome, which is also ethically neutral, are not formed naturally. Therefore, the relentless pursuit of competitive decentralisation within economies and globally is more akin to a desire to implement an ideal rather than a plea to allow nature to take its course. 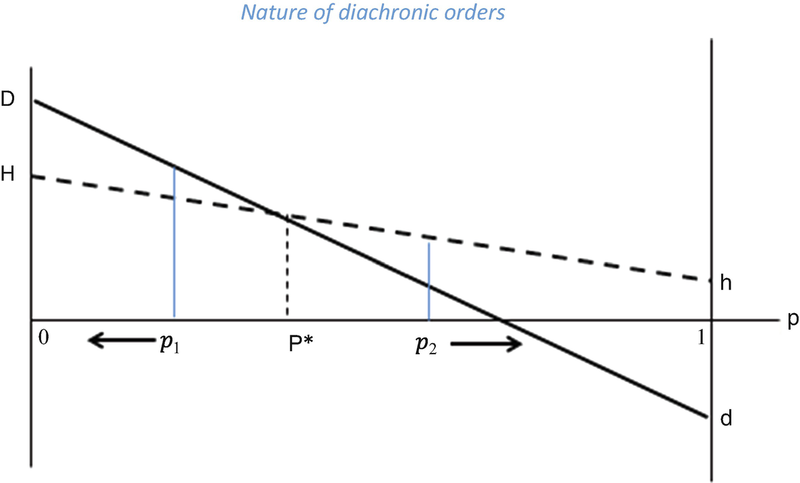 One possible way of explaining the difference between synchronic and diachronic orders is through the examination of the more traditional tool used in the analysis of spontaneous order. I refer here to the idea of evolutionary games. This means that when a Hawk meets a Hawk, they are both aggressive and competitive. As a result, the battle between them will reduce the amount left to each one of them in the end. Each one of them, in such a case, will get h which is the gain they will get from the encounter. This gain can be just physical units of food but it can also include less tangible things like sense of humiliation or exhaustion. By comparison, if a Hawk meets a Dove, the Hawk will take home H (which is clearly greater than h) and the defeated Dove will go home with only d. When a Dove meets a Dove, then they co-operatively share the food and may derive a sense of pleasure from their collaborative activity. In such a case, each one of them will get D, which is clearly greater than what they will get if they met a Hawk (d). The heavy line describes the expected gains of the Hawk when the proportion of Hawks in the population increases from 0 to 1 according to the equation above. The broken line describes the expected returns for the Dove when the proportion of Hawks in the population increased from 0 to 1. Suppose now that at first the proportion of Hawks in the population is given by p1 (<p*). In such a case, as can be seen in the diagram, the expected return of the Hawks is great than the expected return of the Doves. Given that the return each type of individual brings home will determine the amount of offspring they can rear, it is clear that the Hawks, with their higher returns, will have greater abundance to rear more Hawks than the Doves. This, inevitably, will increase the share of Hawks in the population and p increases. This will continue until we get to the point where the share of Hawks in the population reaches p*. Here, the return for either type of individuals is the same so the rearing will be such that each type will produce enough offspring to maintain a stable population where p* will stay the proportion of Hawks in the population for generations. Had we started at a distribution where Hawks make up a proportion p2(>p*) of the population, then the reverse would be true. The expected return on being a Dove is greater than on being a Hawk and this means that the offspring rearing activities of the Doves will be more successful than that of the Hawks and the share in population of the Hawks will diminish until we get to point p*. This is a stable evolutionary equilibrium which was formed spontaneously. At this point we have a combination of synchronic and diachronic orders. For each type of individual, behaving as they naturally do in order to survive will naturally produce an outcome where they will survive (the proportion of either group will not change). It is also a diachronic order because there is nothing about their circumstances which would recommend to any of them to change their behaviour or do something else (as long as the issue at hand is survival). What makes the difference between what I am calling diachronic order and this form of spontaneous order is that it is based, not accidentally, on animals. So yes, in a world of Doves and Hawks p* will create a spontaneous order which will be both synchronic, in the sense that at each period each of the species would survive in the sense that it will sustain its share in the population, and diachronic in the sense that there is nothing internal to lead to a change. However, if we are dealing with humans and if the Hawk and the Dove are just metaphors to how different people tend to behave naturally, then the interpretation of the evolutionary stable equilibrium becomes more complex. If we assumed that people who are naturally inclined to behave in these different manners will pass on to their offspring the same traits, then the previous biological interpretation remains the same. But, if by talking about humans we suppose that the behaviour is a matter of choice (in the sense of habit formation), then the game we described should be interpreted slightly differently. Individuals can choose whether to behave Hawkishly or Dovishly. If p, then, represents their belief about how many Hawks there are in the world, then the equilibrium would mean that the proportion of people choosing to act Hawk in the population will be p* (or, in a more abstract manner, that the probability that the person you encounter would act like a Hawk is p*). This equilibrium will represent a synchronic order in the sense that if people are out there to get the best deal for themselves (which is a problematic issue in itself as it assumes that the objectives of the Doves and the Hawks are the same), the fraction p* will behave like Hawks and 1 − p* will behave like Doves. As long as there is no exogenous change, this distribution of characters, or behaviour, will stay the same. So far, this is not really much different from the idea of spontaneous order which we used before. People, unlike real Hawks and Doves, will form an opinion about the outcome or even about the process. The question is, of course, whether the process whereby they form their moral opinion is independent of what happened here. We will come to this question later in the book, but let us suppose that the public view is that behaving like a Hawk is morally bad, that it is like Mandeville’s ‘fraud, luxury and pride’. It is not inconceivable that people in society choose to act in a morally bad way even though they know it to be so. What is more difficult to accept is that this is a long-term sustainable situation as is implied by the model above. This means that at p* the equilibrium, which emerges synchronically from the compatibility of choices made by individuals, will not be an equilibrium in the long run as the moral/social dimension will affect the returns (construed in broader manner than just the material gains). At p* now, the expected return on being a Dove is greater than that of being a Hawk. This means that there is one equilibrium only and that is to behave Dovishly. If we wish to think about it in more evolutionary terms, we will need to show that the social standing of an individual (which is bound to affect his or her morale) will also be significant in ensuring successful breeding of offspring. If moral opinions are formed by simple majority rules, then the question whether we all become Doves or Hawks depends on the value of the synchronic order (p*). If p* < 0.5, then majority are Doves and Hawkish behaviour will be deemed as evil. This, when translated into social penalties B and P, will make us all Doves. But if p* > 0.5, the reverse will happen and we will all become Hawks. So, can p* which is not a corner solution (i.e. 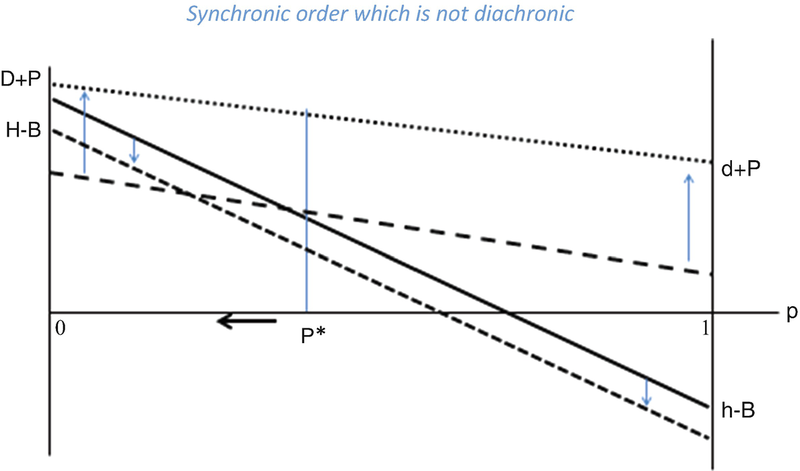 neither 0 nor 1) still be a synchronic order which holds diachronically? The answer depends on how ethics is being formed. One can imagine a world in which being a Hawk and being a Dove are treated as equally valued expressions of human behaviour. In such a pluralistic society, 0 < p* < 1 could constitute both a synchronic and a diachronic order. However, it is important to emphasise that this pluralistic idea works only as long as a Dove can always be a Dove and a Hawk can be a Hawk. In other words, it will work only if the message is not just that it is morally acceptable to be one or the other but that it is something which you can effectively do. In other words, will the economic system support whatever it is that individuals want to be or would it force them to change and adapt. This problem will become to the fore when we discuss the apparent pretence of modern economics to uphold such pluralistic views of morality. In this case, if we start at p1 the Hawks will have too many seriously bruising encounters with other Hawks and the Doves will have enough collaborative encounters with other Doves so that the expected returns of the Doves are greater than those of the Hawks. This means that the number of Doves will increase and the proportion of Hawks in the population will diminish until they completely disappear. The evolutionary stable equilibrium in this case will be for p* = 0 and everyone is a Dove. In human terms, this may indeed generate a happy society which is predominantly collaborative. Alternatively, one can think of the synchronic order as the order which generates what scholars like Locke or Hobbes called a natural state. So, in the natural state here everyone is a Dove, which, in turn, corresponds to Locke’s view. Nevertheless, in Locke, in spite of the natural state being a sustainable natural order, individuals do enter a social contract. This contract, in our case, becomes the framework of the diachronic order. It preserves the natural traits in human behaviour which generated the synchronic order but it goes further to ensure the fulfilment of social (or Divine, in Locke’s case) objectives. If we started with p2, then the expected returns on Hawkish behaviour exceed those on Dovish behaviour and the natural process of propagation or choice of behaviour would lead to an equilibrium at point p* = 1: everyone becomes a Hawk. This, again, is the synchronic order which creates the natural state which is more akin to the one conceived by Hobbes. This synchronic order is an order in the sense that there is nothing which can change the individual traits of the agents but, if we follow Hobbes, the Hawks themselves become frustrated as they would have had more if some of the agents were Doves or because it is far scarier to live in a world of Hawks. Consequently, they may all join a social contract (a diachronic order) which is not changing who they are but is removing their freedom to act. In addition to the fact that adding social or moral considerations may affect the kind of order that emerges, we can also see from this account that the success of the synchronic order in achieving its declared objectives (survival or social preservation in our two stories) are not guaranteed. 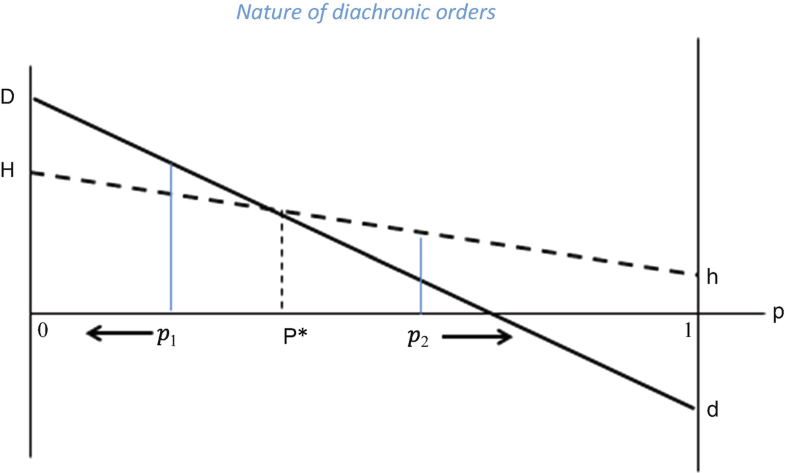 The synchronic order where p* = 0 (everyone a Dove) is not only a diachronic order in the sense that the individual traits which created it would still be encouraged but it produces the best expected returns in terms of survival or social preservation. 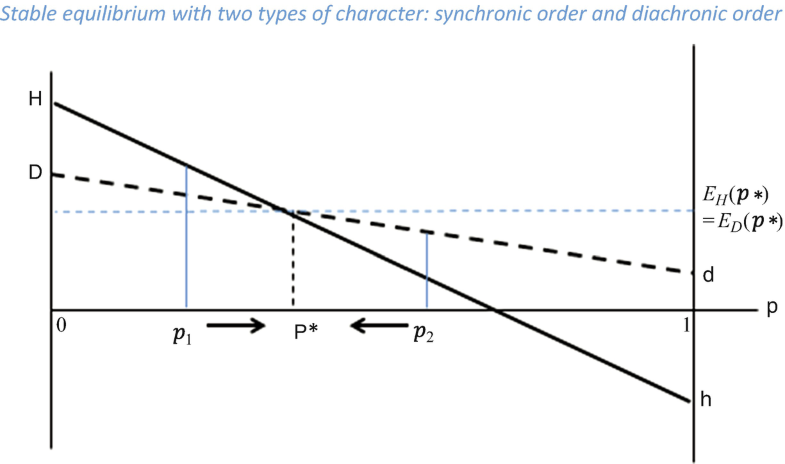 When p* = 1 (everyone a Hawk), the synchronic order is certainly not manageable over time and diachronic order may dictate the stifling of individuals’ natural traits. But not only that, the synchronic order which produces the expected return of h is clearly the worst possible outcome.